The Arlington County Board will consider an emergency snow removal ordinance at its March meeting, one week before the first day of spring. The board also directed itself to draft language for a permanent ordinance, for consideration at the board’s April meeting. 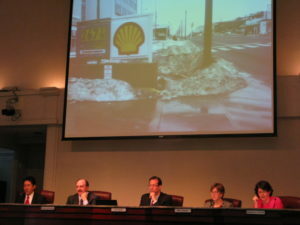 The measures were proposed by board member Chris Zimmerman, who cited numerous examples of snow still covering sidewalks on busy Arlington streets. Board chairman Jay Fisette and board member Barbara Favola voted, unsuccessfully, to remove consideration of the temporary ordinance from Zimmerman’s resolution. Favola questioned whether the temporary measure is necessary, given the low chance of significant snowfall after March 13. She said that while she would support a permanent ordinance that has received community input. Acting county manager Barbara Donnellan cautioned that vetting the emergency ordinance on short notice will require county staff to be diverted from other projects. She also said it would be difficult to notify Arlington businesses of the proposed change in policy. The proposed emergency ordinance, which will be voted on at the March 13 board meeting, requires property owners in commercial districts to clear snow from walkways bordering their businesses within 24 hours of snowfall ending. It would be put into effect for a period of 60 days. Despite the objections of Favola and Fisette to the emergency ordinance, Zimmerman’s resolution passed unanimously. While some residents are upset with the county for not making more of an effort to clear the mountains of snow and ice deposited on sidewalks by county plows, others are calling for a sidewalk snow ordinance to punish property owners for not clearing the sidewalks themselves. New sidewalk snow removal policy in @ArlingtonVA could come as soon as Tuesday… Nice work @GordonSimonett & @ArlingtonYDs!